This Christmas season (2006-2007) Epiphany is celebrated on January 4. Today would be a good day to plan and make materials needed for the feast of the Epiphany or your Twelfth Night celebration. Epiphany House Blessing: You will need different colored chalk and holy water at minimum. Invite a priest over for dinner to do an Epiphany house blessing. You could also have the three kings (or more) come and put their marks on the lintels —the kings can be the children or the male adults. Crowns for the Kings: These may be easily made of colored paper, gold poster board, poster board decorated with gold or silver wrapping paper or aluminum foil. Take a piece of stiff paper about three inches wide and 24 inches long. Cut diagonals in the top section of the strip so as to leave points for the crown. The ends may be glued together or tied with a ribbon. Pearls and other gems of cut paper may be added for effect. The gospels don't reveal that there were only 3 kings, just that there were 3 gifts, so as many children you have can be the kings. No time to make crowns? Remember that the Kings were actually "wise men" or "magi" in the Gospels, and so creativity can rule on what kinds of costume Persian magi would wear! 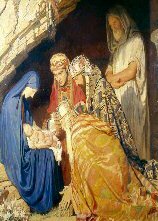 Have multiple depictions of the three kings at the Nativity, so that the children can decide how they want to be portrayed. Web Gallery of Art has multiple images. Search for "Epiphany" and "Magi". Other Paraphanalia: Depending on time, budget, etc., perhaps scepters, royal capes. Also having something that represents the actual gifts of gold, frankincense and myrrh (the latter two are available at many stores) and containers to hold them in. The gold can be gold foil covered chocolate "coins". Epiphany Drama Plan an Epiphany drama or play, either for adults or children. Plan a simple stage, the costumes for the Kings and a little nativity scene and of course, Herod. Procession to the Royal Crib If part of your Christmas decoration incorporates a manger with the Christ Child, for Epiphany the Christ Child can be crowned as King. Our family had a homemade wooden manger, placed on our family altar. The manger was filled with straw (from the sacrifices made throughout Advent), and Jesus was represented with a small rubber baby doll, about 8", dressed in swaddling clothes for Christmas. A doll was used instead of a statue so that young children could hold and "love" Baby Jesus without fear of breakage. At Epiphany, the doll was crowned and had a red cape with gold trimming. Gold fabric was arranged around the manger, and white lights and candles all around it. For your royal crib, make a small crown for the statue or doll. We used the back of a Christmas card with gold foil cut in the shape of a crown, and arranged small "jewels" and other decorations. Another touch would be a royal cape — red, purple, or gold, or some type of regal fabric. All you need is a square or rectangular piece of fabric, and some type of drawstring. Add trim to the fabric, if desired. Turn under about 1/2 - 1" at the top of the cape and sew a seam. Through this seam pull through the drawstring. Gather together and tie around the doll or statue. Decorate around the manger with gold and fancy materials, lights and candles, all fit for a king. See Procession to the Royal Crib and The Crib Enthroned on Epiphany, Enthroning the Christ Child for Christmas Eve. Foods for Twelfth Night: Prepare the menu and shopping list. The hardest decision will be deciding which country's recipe for Epiphany bread you will want to make. See the long list of different breads or cakes from various countries. Perhaps try a one new one every year. And of course, there's always a simple crown cake you can make. Lamb's Wool is the traditional beverage served at Twelfth Night, and there are recipes for both alcoholic and non-alcoholic versions.